Left alone, no lawn is going to be okay. Naturally, to satisfy the bare minimum of neighborly courtesy, your lawn needs to be mowed on a regular basis. Most homeowners want more than merely preventing disgruntled phone calls from their lawn. A healthy, beautiful lawn is a great asset to the curb appeal of your home, and a lawn care program will keep your lawn healthy and growing. No matter how much money you spend on lawn maintenance, it's almost certainly not going to cost as much as re-sodding a diseased or dead lawn. You might like to believe that you have the time, energy, and gumption to take proper care of your lawn, but in most cases, homeowners benefit greatly from farming out some or all of their lawn care to the professionals. So what does a Houston lawn service company have to offer? You'll never need to mow your lawn again, for starters. Plus, they'll edge your lawn with a weed-whacker, do some basic landscaping as needed, and generally keep your lawn looking its best. The biggest benefit, however, is probably their professional fertilizing and pesticide treatments. Sure, any homeowner with some basic lawn knowledge and a decent amount of time can do this themselves, but periodic soil testing, uniform application of fertilizer, and local knowledge of both your lawn and the effects of weather patterns and seasonal fluctuations are all under the purview of a Houston lawn service company. Plus, while you may be able to find a neighborhood kid to mow your lawn, Houston lawn service companies rely on your business for their living, not for weekend spending cash, which means they also tend to be more reliable. 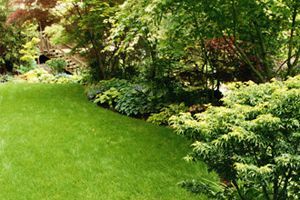 In short, lawn care professionals may not do anything you can't do yourself, but they may be able to do it better and in a more efficient, dependable manner. The one thing that may still be outside the purview of a lawn service company is the daily watering your lawn may need during the summer. In Houston, lawn irrigation gets particularly tricky with periods of heavy rain followed by several days of blistering heat. You want to keep your lawn watered, but you don't want to over-water, either. Besides the fact that you probably don't need your Houston lawn service professional at your home every day, there's also really no way to tell in advance whether your lawn will need to be watered that day. To make things more complicated, the best time to water your lawn is late morning, when the sun will have plenty of opportunity to rid your lawn of any excess water. Watering your lawn when you get home from work is just as likely to create more problems because your lawn may have to endure standing water as it gets absorbed into the soil. A sprinkler system is often the best, and only reasonable, way to deliver the right amount of water and irrigation control to your lawn. Simply check the weather before you leave for work and you can press a button to have your lawn watered while you're at work or left till the next sunny day. As you might expect, how much it's going to cost for this type of lawn maintenance really depends on the size of your lawn, the range of lawn treatments, and the frequency of the visits. Most companies offer service packages that provide more comprehensive service while keeping the cost at a reasonable price. Single visits may cost $100 or less, but your best value is going to come, naturally, with a long-term contract. Several hundred dollars to just more than a thousand per year will likely be enough to keep your lawn in its best shape. Comment: Sometimes the sprinkler doesn\'t stop watering after the scheduled time is finished.\r\nI also want to check one zone to make sure it works. the other zones are OK. Comment: Our grass is getting thin and dying. Trees have been trimmed to provide more light. Sprinkler system adjusted to hopefully balance water needs. Fertilized already which increased the color but the grass is still very thin and missing in places - besides where the dog lays. Comment: I would like to get an estimate for install soaker hose system in garden beds. Comment: Stations 2, 3, 4, 5, & 6 are skipped in the cycle . Houston Lawn Care Services are rated 4.71 out of 5 based on 6,919 reviews of 173 pros. Not Looking for Lawn & Garden Care Contractors in Houston, TX?